Made with milk and real cream, Philadelphia Original's distinct fresh and creamy taste makes it a delicious soft cheese for the whole family to enjoy. 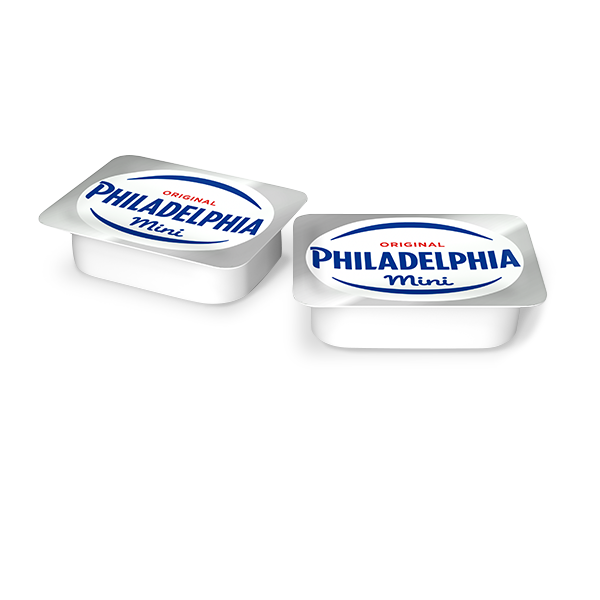 Philadelphia Original Mini Tubs are a great alternative if you want to enjoy your Philadelphia at work or as a snack. Philadelphia Original is also available in 180g and 280g tubs which are fantastically versatile, whether you are using it to bake an indulgent cheesecake or spreading it your favourite bagel topped with salmon. Philadelphia works well with both sweet and savoury dishes, and is available in a range of flavours to match your tastes. See our recipes for more delicious inspiration. Made with pasteurised milk and with no added preservatives. Suitable for Vegetarians. Full Fat Soft Cheese, Salt, Stabiliser (Locust Bean Gum), Acid (Citric acid). Suitable for vegetarians.